The film, The Secret Garden, is based on the classic children's novel by Frances Hodgson Burnett. It is one of several versions of the classic on film. A young girl, living in India, is left orphaned when her parents die in a plague. She is sent back to England to live in a rural mansion, where she lives with friends of the family. Her guardian is a strange, distant man, Archibald Craven, who is an invalid. At first, Mary, taken care of the servants and housekeeper, is willful and uncooperative. Mary begins to make friends with a local boy who seems to understand nature and animals. And she begins to investigate the secrets of the house—strange noises in the night and the a secret closed-in garden. The noises, it turns out, come from the son of her guardian, who stays in bed and who believes that he is growing a "hump" on his back like his father's. Mary sees that the son, whose name is Colin, is spoiled, and she becomes a positive force, encouraging him to try things and break out of his invalid life. Mary, Dickon, and Colin begin to work clandestinely to restore the garden, with Colin gradually gaining strength and confidence as the garden returns to life. When Colin's father unexpectedly returns home, he finds his son miraculously restored to health. This version of Secret Garden features a young and very handsome Colin Firth for a total of 1 minute and 25 seconds of screen time--at the very end of the film. Looking as if he just strolled over from the set of Lost Empires (same director Alan Grint), still in his World War I uniform, Colin Firth plays the adult Colin Craven. This is a film that can actually be viewed by the whole family with a PG rating. The screenwriters take a bit of license with the book by cutting the family connection between the two children and writing Mary Lennox 's father as a close friend of Archibald Craven. This sets the stage for the script's little romance angle between the grown-up children, Mary Lennox and Colin Craven at the film's end. This is not in the book at all, but as it gives us another role for Colin Firth it seems to be a brilliant idea. As mentioned, Alan Grint also directed Colin the Grenada Television's series Lost Empires, set in the musical halls before World War I. In that role, Colin plays a World War I soldier in the opening sequence and then again at the end. The house in the film was Highclere Castle, Newbury, England, UK. It is near the Newbury racecourse. Highclere is the ancestral home of the Earls of Carnarvon, the most famous of which financed the expedition that located King Tut's tomb in the 1920s. The scriptwriter, Blanche Hanalis, also wrote the script for Camille (also a Hallmark Hall of Fame production), in which Colin Firth starred as Armand. "I was given the sort of English public schoolboy stamp. It got me my first and my second and third jobs. Very high-profile stuff. I was delighted to get them, but then there comes a point when you think 'but I can't keep doing this.' I'm not that - I'm not a public schoolboy, you know. I went to a secondary school. I went to the worst type of English schools and uh, and I didn't talk this way as a schoolboy - I spoke with my regional accent. It's not what interests me ultimately. I didn't want to spend my entire life telling the stories of various English, privileged men - it's not me." Coming soon: URL link to Jane's Firth articles page, for the full-length versions of articles from which quotes are taken. Mary Lennox (Gennie James), orphaned when her parents die of the plague, is sent from India to England to live at Misselthwaite Manor, the sprawling, forbidding Yorkshire residence of enigmatic, hunchbacked Archibald Craven (Derek Jacobi of "I, Claudius"`). There the demanding girl meets Mrs. Medlock (Billie Whitelaw), the stern but kindly housekeeper; Colin Craven (Jadrien Steele), Archibald`s hypochondriac son; just-plain Dickon (Barret Oliver), the nature boy who hangs out on the moors and reportedly holds conversations with the animals; and Ben Weatherstaff (Michael Hordern), the crusty gardener chosen to serve up the movie`s key line, "When you tend a rose, a thistle cannot grow." That message runs hot and heavy in the book, published in 1909--a theme that future songwriters would restructure to convey the need to keep your sunny side up and accentuate the positive, eliminate the negative. 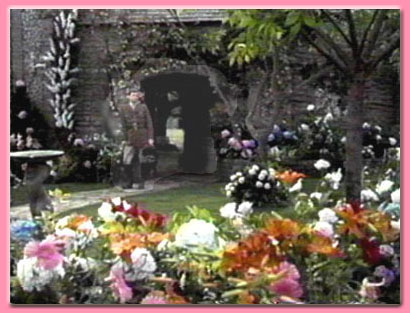 The not-so-subtle symbol used by Miss Burnett is the garden that the lord of the manor ordered shut after his beautiful young wife was killed in an accident there. No blushing violet, Mary discovers the key one day, shares her secret with her friends, and undertakes the task of restoring the garden. Like Mary and Colin's once-arid lives, the long-neglected "magic place" represents unattained fulfillment and wondrous regeneration. A stylish, handsome "Hallmark Hall of Fame" production greatly enhanced by Robert Paynter's lush photography, "The Secret Garden" makes for good, quality family fare. Adaptor Blanche Hanalis retains an old-world rural charm while updating the original by bringing in a World War I-aftermath interlude before the quintessential storybook ending, and director Alan Grint shamelessly fills his frames with elements that should appeal to younger viewers: spookily shadowy corners, raging winds, crackling lightning. It all wouldn't work if the lead were a cloying little simp, and 10-year-old James ("Alex: The Life of a Child"), happily, handles her assignment with consummate skill. Displaying a spunky charm in transforming Mary Lennox from an unloved, coddled child into an all-wise centerpiece of caring, James comes off as a Margaret O`Brien without the mannerisms. FAVORITE QUOTES . . . Since Colin has only scene in this film, it is, of course, the favorite. Colin Firth's screen time is composed of the following . . . The viewer first hears a voice saying the following line, and then sees Colin is standing near the garden doorway, striking a pose, leaning on his cane . . .
Colin: "Where you tend a rose a thistle cannot grow." Mary: I wasn't sure the hospital would release you. Colin: Do you think I would let a little shrapnel stop me? (Pause) When I was at Oxford, I asked you to marry me. When I was in France, I wrote you and asked you to marry me. Why wouldn't you give me an answer, Mary? Mary: I wanted you to ask me here in our garden. Colin: I should have known. Would you marry me, Mary Lennox? 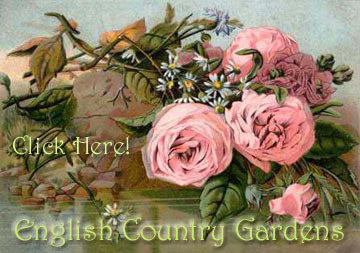 Frances Hodgson was born in Cheetham Hill, of Manchester, England, on November 24, 1849. Her family (she was one of five children) was in financial difficulty after the death of her father, who had been a silversmith, in 1854. Frances and her sisters went to school in a neighbor's house and she was popular among her peers as storyteller. In 1865, the family immigrated to the United States and settled in New Market, near Knoxville, Tennessee. However, the financial assistance hoped-for from a maternal uncle failed to materialize. To make ends meet, Frances briefly set up a school. In 1868, Hodgson had a story published in Godey's Lady's Book, a well-known magazine. She had earned money for paper and stamps she need to submit her stories by grape picking. Within a few years, she was being published regularly in Godey's, Peterson's Ladies' Magazine, Scribner's Monthly, and Harper's, and she began to earn more and more money from her writing. In 1873, after a year's visit to England, she married Dr. Swan Moses Burnett of New Market, Tennessee (they divorced 1898). Burnett's first novel, That Lass o' Lowrie's, was published in 1877. The book, set in Lancashire, combined a remarkable gift for realistic detail in portraying scenes of working-class life--unusual in that day--with a plot consisting of the most improbable of turns. In 1886, Burnett's most famous and successful book appeared—Little Lord Fauntleroy. He told the story of a poor little boy who finds out that he is the heir to an English title. Little Lord Fauntleroy was intended as a children's book, but it had its greatest appeal to mothers. The book sold more than half a million copies. Burnett said that the main character was inspired by the younger of her two sons, Vivian. The main character's long curls were based on Vivian's and his velvet suit with lace collar was based on Oscar Wilde's attire. Her later books include Sara Crewe (1888), dramatized as The Little Princess (1905), and The Secret Garden (1909), both of which were also written for children. These, like most of her 40-odd novels, stress sentimental, romantic themes. In 1893, she published a memoir of her youth, The One I Knew Best of All. From the mid-1890s, she lived mainly in England, but in 1909, she built a house in Plandome, Long Island, New York, where she died on October 29, 1924. Her son Vivian wrote a biography of her in 1927 entitled The Romantick Lady. 1. This warm hearted story by Frances Hodgson Burnett was first introduced to the public on celluloid by way of silent film in 1919. 2. In 1949, it was made into a talking black-and-white film. 3. And a more recent, beautifully photographed version that showed in theatres. 4. An award-winning version of the book was produced on Broadway in the 1990s. Ranking In The Films Of Colin Firth: Too few minutes to rank. Watchability & Rewind Factor:***** You must rewind, and often, or by the time you know he's on, it's over!!! The page is part of a Firthland project on the films of Colin Firth. "Till We Meet Again," just click on the stop button in its window below.